The tiny moths that are sometimes seen in bird cages are Indian meal moths, also called pantry moths. Their eggs may be found in commercial bird seed and will hatch over time. These little moths are not harmful to you or your pets -- some birds will even eat them -- but they can be irritating pests. The first step to eliminating moths from your bird cage is to avoid purchasing infested seed. Adult moths lay eggs on or in the bird seed. The hatched larvae are tiny white worms that spin webs among the seeds, eating as they go. 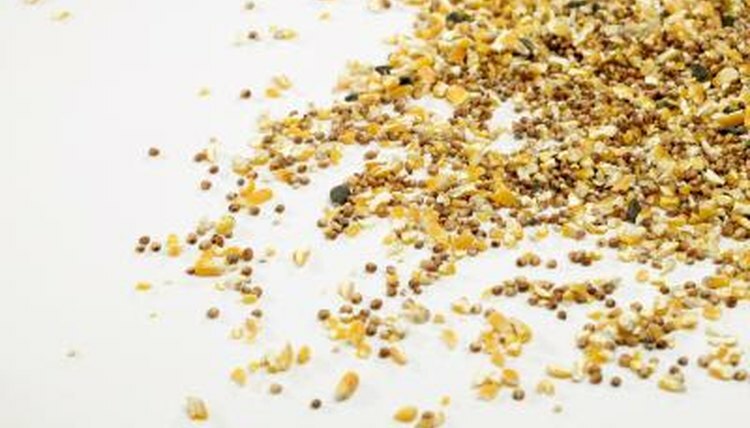 Infested bird seed has a lower nutritional value than fresh, pest-free seed. Avoid buying open or crushed bags of seed, and seed that contains webbing, worms or insect pieces. Freezing your bird's seed for three or four days when you purchase it can kill any unhatched eggs that you can't see. Store the seed in an airtight container in a cool, dry place. It can be kept in the refrigerator, or outside in a critter-proof container during cold weather. Purchase the freshest bird seed available and only buy what you can use in a short period of time. The longer you store your bird's seed, the more you risk a moth infestation. Discard any seed that begins to show signs of being infested. Moth larvae become grain beetles, which will hide in the cracks and crevices of your cupboard or pantry. Vacuum your seed storage area often, paying attention to corners and hidden areas. Empty the vacuum bag into a sealed bag, placing it in your outside trash to avoid re-infestation. Wash the storage area and your bird cages with a non-toxic cleaner such as diluted white vinegar and baking soda. Fresh seed, a clean storage area and clean bird cages will help keep those pesky moths out of your bird cages.